These photos are from an "Love and Other Realities", a shared exhibition at the Reflections Cafe in the White House Community Centre in Hampton with photographer Claire Harris. Click the links at the bottom for the facebook event and a map. From North Yorkshire to New York is a collection of 47 photographs which have been selected from a large body of work over the last 6 years, with many of the prints never previously shown in public. The theme reflects a sense of longing for a particular place or moment - for home, or for new experiences. The images are taken on a variety of media, from a Nikon DSLR to a Kodak-Eastman No.2 Box Brownie. One picture was even taken using the 2mp camera on a cheap Nokia Phone, and others using an iPhone 4. You can also buy prints online here, and the limited edition book accompanying this exhibition here! 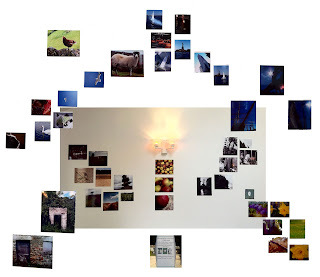 Here's an image made up of some photos I took at the exhibition - just to give an idea of how I put it all together in the space! Thank You! I'm just uploading them to Photobox now so people can buy prints online!